We are an audiovisual duo. In a mixed music artform, Lola Ajima associates electroacoustic compositions, voice and live cello looping. Yukao Nagemi develops his own environment for digitally augmented performative drawing by adding digital effects on ink and tablet drawing. Our audio and visual creative processes are deeply intertwined from the early improvisations to the final performances on stage. We create works by combining traditional instrument performance (music and drawing) with the most cutting-edge digital processes. Our compositions confront generative processes in an innovative postmodern artform which questions our relationship to technology and information flow. We are inspired by ancient myths and cultures, and how these strong human beliefs have survived in our society. Our performances are poetic in the sense that they articulate complex sensibility to contemporary dramas with a subtle mix of traditional expression and digital features. We do not tell stories as such, but however develop narrations during our performances with our own visual and musical languages both representative and symbolic.
. the endangered species and our own human fragility facing the increasing political and social control and its psychological pressure as reflected in social media. Besides our collaboration in Lola and Yukao Meet, we also develop our own singular art practice. We have regular collaborations with other artists, both as a duo and as individuals. Our major collaboration as a duo, was with the installation artists Scenocosme. Together, we developed an interactive immersive installation about a sensitive and responsive room. Lola has an electroacoustic art career and enjoys to compose for classical musicians in mixed music projects where she augments classical instruments. She also works on sound and music for art shortfilms and for contemporary dance. Yukao develops his own ink-on-paper drawings about myths and human psychology. He collaborates with musicians and composers for audio-visual compositions or improvisations. Lola and Yukao Meet's intricate association of soundscapes, music, graphics, and digital effects carries the audience through initiative journeys with references to human myths and dystopian artifacts of our contemporary lives. "...art must must carry man's craving for the ideal, must be an expression of his reaching out towards it; that art must give man hope and faith. And the more hopeless the world in the artist's version, the more clearly perhaps must we see the ideal that stands in opposition - otherwise life becomes impossible! Art symbolises the meaning of our existence." Andreï Tarkovski, Sculpting in time. Lola Ajima is the artist name of a singer/bass/cello player and composer. In her former band activity she amused herself with indie rock and dreampop/industrial. She has also composed soundscapes for contemporary dance performances and soundtracks for short movies. Currently she is following the electroacoustic composition education at Conservatoire Pantin, Paris. Yukao Nagemi is a visual artist who combines figurative hand drawing with abstract generative digital effects. He questions our relationships to science and technology and their dramatic syndromes. 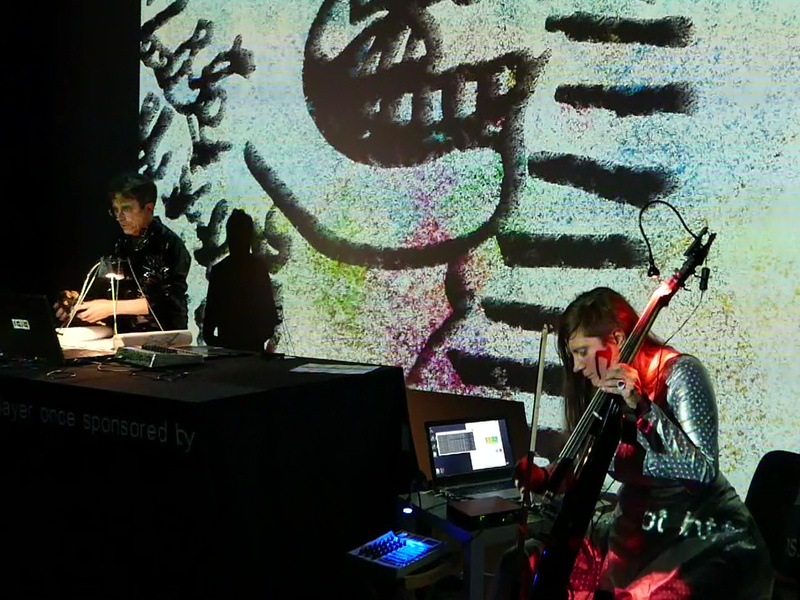 As media, he uses ink and tablet drawing, live graphic performance, programs for generative graphical effects, and video. Lola Ajima est d’origine danoise, Yukao Nagemi est Français. Ils se sont connus à Berlin en 2009, et forment depuis à la fois un couple et un duo artistique baptisé Lola and Yukao Meet, s’inscrivant dans une pratique résolument transdisciplinaire. [...] A travers Lola and Yukao Meet, les deux artistes poursuivent leurs recherches, entremêlant création sonore, art numérique, dessin et peinture pour créer de singulières performances. Many thanks to Marie-Laure Desjardins and ArtsHebdoMedia for promoting media, mobile, digital... arts, and promoting and supporting events and artists in these domains. Pixels pulsate, multiply, collide, and swarm in generative nights, an audiovisual “exploration of an underground world hosted by micro-organisms that infinitely replicate” created by Lola and Yukao Meet, the duo comprised of composer Lola Ajima and graphical artist and scientist Yukao Nagemi. Inspired by cellular automata, the graphical and audio patterns of their video collaboration are meant to spark the viewers’ imaginations with images of “industrial halls, cities at night or a biologist’s lab bench,” according to the artists. Il est français. Elle est danoise. Il dessine et projette en direct sur un écran ses œuvres grâce à une machine conçue par ses soins pendant qu’elle joue du violoncelle électrique à ses côtés. Ce n’est pas le genre de rencontre que l’on s’attendait à faire dans le sous-sol de la Maison pour tous des Amonts, un mardi soir. « Vous êtes tombés sur les bobos du coin », lance en riant l’artiste en répétition, Christian, qui se fait appeler Yukao Nagemi sur scène. "Yukao creates real-time organic digital images, spatial, fluid and sublime. Lola's voice is as melodious as her instruments. "During the Gallery Night of Copenhagen Art Week in September 2013, the passengers and other visitors of Sydhavn Station were struck by some unusual sounds. In the Exhibition Space Sydhavn Station, a former ticket office, LYM was performing their NINE (9) piece in the installation space of the group exhibition, The Death II. Les Studios Musicaux, Le Café-Musique Le Radazik et La ville des Ulis, France. Fonds de soutien à la création artistique numérique SCAN.